THE LITTLE DANDY : Affordable Workouts: Getting In Shape Doesn't Have to Run You Broke! 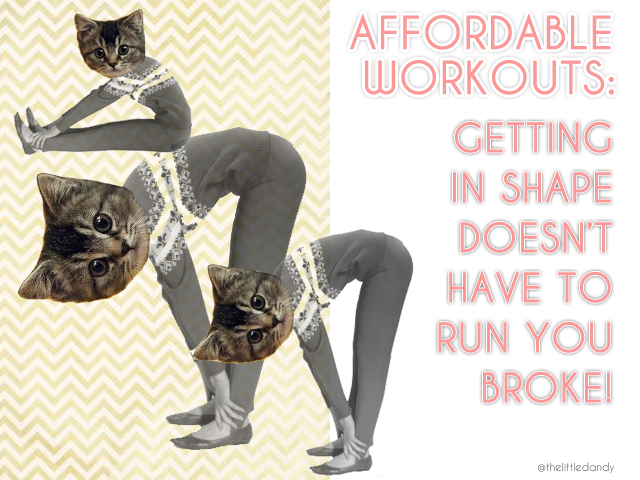 Affordable Workouts: Getting In Shape Doesn't Have to Run You Broke! Affordable Workouts! Retro lady image from Tack-O-Rama. One of my resolutions for 2014 is to be a healthier, happier, person. What better way to achieve this then to work out, amirite?! In my younger days I was some sort of invincible olympian, I swear. I taught Tae Kwon Do, ran track, was a gymnast -- I even worked out for the heck of it (what?!). I kept up my fitness throughout my university years, but some time after graduating I threw it all out the window and just let myself "go". I'm not saying I sat on the couch until I grew to resemble something whale-like (in fact, I've actually some-how shrank in size). What I'm saying is, my muscular strength has completely diminished; I am a soft - very VERY soft - marshmallow. When you're easing back into getting in shape, or if you're a completely new to working out, spending a ton of money on workout gear and memberships doesn't at all seem like a wise investment, which is exactly why I wanted to share this with you guys. Blogilates/Hot Yoga/Workout Buddy: Images 2 & 3 sourced from Pinterest. Here are my top 3 affordable workout regimens. Keep in mind, I'm no fitness expert nor am I even remotely in shape, but I think these workouts are the most affordable and most effective for beginners that want to ease back into getting in shape (like me!). Have you heard of Cassey from Blogilates?! If you haven't, just stop - STOP- what you are doing and go check out her YouTube channel. This girl is amazing. Not only does she make easy to follow work out videos, she goes out of her way to create calendars with a mapped out workout plan for each day of the week-- ALL FOR FREE!! A god send, really. Now, I know what you're all thinking - "UMMM Hot Yoga classes cost an arm and a leg!" Well, it doesn't always HAVE to. This may not be a solution for everyone, as you'll have to be living in a big busy city with an influx of hot yoga studios. A lot of hot yoga studios offer promotions for first time yogis, and its usually a a flat rate (around $40-$60) for an entire 30days of unlimited yoga. Map out your closest hot yoga studios, and have your fill one month at a time! Not to mention, hot yoga studios also often offer promotions on group deal sites such as Groupon. Allow me to go into further detail about this one because it's about more than JUST a workout buddy; it's about a workout buddy who has free access to a gym - or maybe YOU are the workout buddy with the free gym access?? Again, this may not be an accessible option to everyone, but in Toronto opportunities are a'plenty. A lot of my friends live in high rise condos in the downtown core, and ALL of their buildings have a gym. Ask one of your friends who works out if you can join them a couple times a week, or if they don't work out you can plan to get in shape together. Did I mention that working out with a buddy is also great quality bonding time? Let the girl talk flow sista'. If you're an extreme case, like myself, you may be in need of some solid workout gear. I, for one, didn't even own a sports bra until last week (true story). I started to shop around, and little did I know that a Nike sports bra retails for at least around $40! It's not even a whole shirt! Anyway, here are my suggestions on top 3 places you can buy affordable active wear. Keep in mind that if you're going to be sweating a LOT, you want to look for fabrics that wick away moisture like nylon and spandex. Try to stay away from cotton! Forever 21 offers a variety of low-high impact sports bras at as low as $12.80, as well as workout tops and bottoms at very fair prices. What's even better is that when they're on sale, they're even cheaper! Joe Fresh also offers a variety of active wear in similar price ranges as Forever21. However, their styles are a bit more mature, and their sizing fits bigger. Lastly, if you're a stickler for the "quality" that big brands offer, you can always check out your local discount store like Winner's or Marshall's to get Nike, Addidas or what have you at lower than regular retail price.